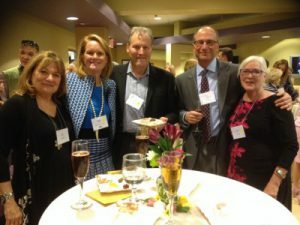 On April 14th our wonderful friends at UNC REX Healthcare graciously hosted us for an amazing food and wine event. 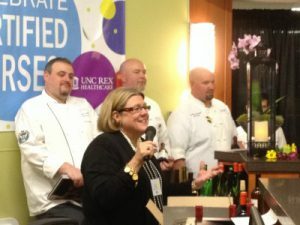 Award-winning Executive Chef Ryan Conklin, who led a team of UNC REX Healthcare chefs on to win the final Battle of Champions in the statewide “Got to Be NC” Competition Dining Series, prepared a fantastic French-themed dinner. The amazing menu featured a selection of homemade canapÇs, charcuterie, and French-style cheeses, as well as a five course strolling dinner. The UNC REX chefs went above and beyond for our guests–taking the time to explain each course and teaching everyone a thing or two about French culinary traditions; all the while, Bill Baucom, local singer and songwriter, provided a lovely backdrop of music–even a French tune or two. Networking, delicious appetizers, and an exquisite sit-down meal paired with very fine French wines. 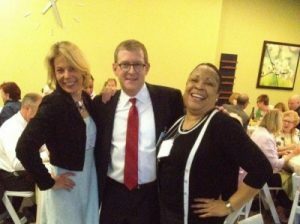 Needless to say, a great time was had by all!